Traditionally used to treat diarrhea and oral inflammation, ancient folklore associates blackthorn with witchcraft and ill omens. Blackthorn is native to Europe, western Asia, and northern Africa. After blackthorn charcoal and its fruit seeds were found in an archaeological site near Dublin, it has been argued that the herb's use dates as far back as the 13th century. The history of blackthorn is rooted in the United Kingdom, as blackthorn was traditionally used as a "cattle-proof" hedge to keep the cattle inside the perimeter of the land. Blackthorn was also commonly used as a wind and snow screen for land because of its density. Blackthorn is still studied today, as it thought to possess many medicinal properties. Reducing inflammation. The active compounds in blackthorn have been shown effective for the treatment of inflammatory processes in the mouth and the respiratory system. Promoting gastrointestinal health. Blackthorn posses both astringent and laxative properties, which make it effective for stopping diarrhea, but also for regulating digestion and relieve constipation. Aiding urinary retention. The diuretic and anti-inflammatory activities of blackthorn promote urination, which contributes to the elimination of toxins and help treat urinary tract infections (UTIs). Tannins have strong antiseptic, antidiarrheal, and anti-inflammatory actions. The primary compounds that are responsible for blackthorn's health benefits are tannins, flavonoids, and phenolic acids, all of which are responsible for the antiseptic, antidiarrheal, and anti-inflammatory actions of the plant. On the other hand, rhamnazin, a natural flavonoid found in plants such as blackthorn, been shown to possess strong antioxidant and anti-inflammatory properties, which inhibit oxidation and protect cells against free radicals. Rhamnazin has also shown protective properties against inflammation in acute lung injury, inhibiting the metabolism of cytokines, which are proteins secreted by the immune system in order to affect cellular functions. Other fruits with anti-inflammatory properties are cherry and melon, while kiwi and pineapple share similar digestive properties. There are no reported side effects for blackthorn, and the herb is considered safe in recommended amounts. However, as other members of the Prunus family, blackthorn contains cyanogenic glycosides, which are toxic in large quantities, and long-term consumption is not advised. Symptoms of cyanide poisoning include shortness of breath, weakness, light-headedness, seizures, stupor, irregular heartbeat, and cardiovascular collapse, causing coma and death in extreme cases. Blackthorn can also cause "plant thorn injury", which is caused when the thorns of the bush penetrate clothing, gloves, or shoes, and produce an infection due to their poisonous compounds. Care should be taking when handling the plant. 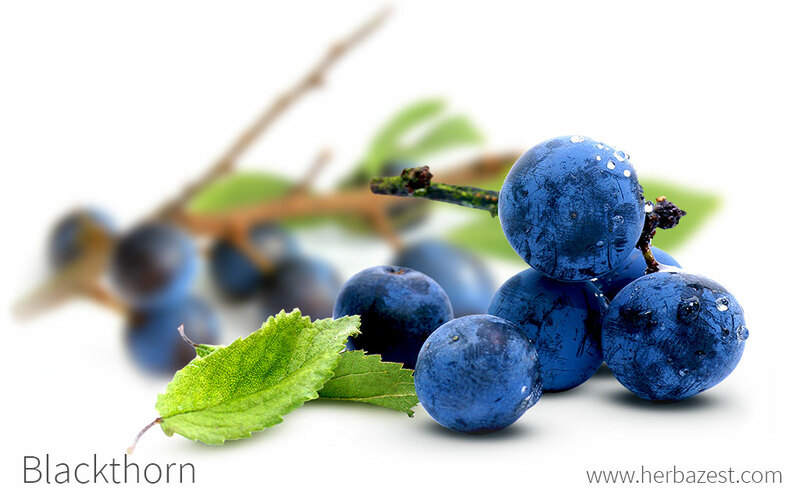 The oral consumption of blackthorn is contraindicated in women during pregnancy and lactation. While blackthorn is more commonly known for its industrial and culinary uses, it can also be consumed in medicinal preparations that concentrate its healing benefits and can be easily prepared at home. Cooked. The fruits of blackthorn are commonly used to prepare fruit pies, jams, dyes, and syrups. Infusion. An infusion can be brewed from one to two grams of dried blackthorn flowers. One or two cups can be taken per day. Gargle. A blackthorn gargle is made by brewing an infusion of two to four grams of dried fruit. Fresh fruit juice can also be gargled. This is used to reduce mouth and throat inflammation. Capsules. The dried leaves and berries of blackthorn are finely ground and consumed in these supplemental forms, which offer safe, standardized doses, sparing the herb's bitter flavor. Often commercialized under its alternative name of sloe, blackthorn dried berries and leaves can be purchased online in bulk form or as teabags. The berries of the plant usually consumed as juices, syrups, jams, and pies because they are quite bitter on their own and ban be bought in some organic markets and online. Under the names Prunus spinosa and sloe berry, capsules of blackthorn are easily available for purchase through online retailers. Blackthorn products are becoming more widely available in the U.S. due to the herb's increasing popularity. This thorny shrub, with white flowers and dark branches, is native to Europe and western Asia, but it can also be found in New Zealand and eastern North America. It naturally grows in hedgerows and woodlands, where it can form dense stands. Blackthorn is a relatively low-maintenance, slow-growing shrub that is though and resilient once established. Blackthorn can be easily propagated from softwood cuttings or from seed. Blackthorn grows best in full sun and tolerates most soils, as long they are well-drained, except the acidic ones. It requires moderate water and occasional pruning. Blackthorn naturally spreads by suckers, as well as by bird- or animal-sown seed. Regular weeding is necessary in order to prevent uncontrolled growth. Blackthorn is a woody, deciduous shrub that can grow up to 20 feet (6 m) in height. It is characterized by dull green leaves, white flowers, dark bark, and showy blue-black, spherical fruits. Blackthorn fruits are very similar to plums, a close relative. Blackthorn, or Prunus spinosa, is a member of the Rosaceae family, among other economically important species, such as apple (Malus domestica), apricot (Prunus armeniaca), blackberry (Rubus fruticosus), pear (Pyrus communis), and plum or prune (Prunus domestica). There are several species related to blackthorn that are also used medicinally. The most well-known related species are plum (Prunus domestica) and wild cherry (Prunus avium), which were used traditionally for their diuretic and astringent properties. Other relatives of blackthorn are morello cherry (Prunus cerasus) and black cherry (Prunus serotina). Blackthorn is widely used to make a variety of products, but its main economic value lies in the food and beverage industry. The high economic value of blackthorn can be attributed to the commercial sale of the raw and its wide use in making gin, wine, preserves, and various desserts. China leads the world production of sloe, yielding over 6 million tons in 2012. Alcohol industry. Blackthorn is most well-known for its common use in making gin, most commonly called sloe gin. Wine, juice, and cider are also beverages commonly flavored with blackthorn. Timber. Blackthorn wood is especially hard and it has been used to make walking sticks. A 'shillelagh' is a highly polished stick of blackthorn wood that was made and used in Ireland for self defense and it is now used in a form of traditional fighting or martial art. Living fence. Widely grown as a hedge plant, blackthorn can also act as a 'nurse plant', allowing other plants to develop protected from possible damage by grazing animals. The shrub is also used to keep cattle within property lines. Fuel. Blackthorn bark makes good firewood because it burns slowly and provides ample heat. Germplasm Resources Information, Taxon: Prunus spinosa L.
Kew Royal Botanic Gardens, Kew Science, Plants of the World Online, Prunus spinosa L.
Kew Royal Botanical Gardens, Kew Science - Plants of the World Online - Prunus spinosa L.